Item #GSE-555: 23mm diameter Bloodstone Sphere; dark forest Green Bloodstone Sphere with splotches or orangy Red. Item #GSE-115: 18mm diameter, dark forest Green Bloodstone Sphere with splotches or orangy Red. Item #GSE-552: 19mm diameter Bloodstone Sphere, dark forest Green Bloodstone Sphere with splotches or orangy Red. 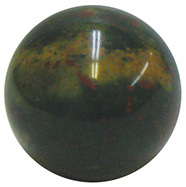 Item #GSE-114: 20mm diameter, dark forest Green Bloodstone Sphere with splotches or orangy Red. Item #GSE-553: 21mm diameter Bloodstone Sphere, dark forest Green Bloodstone Sphere with splotches or orangy Red. Item #GSE-554: 22mm diameter Bloodstone Sphere; dark forest Green Bloodstone Sphere with splotches or orangy Red.